ALTHOUGH still not divulging the actual number of visitors, the organizer of the Riviera by Mode City swimwear salon provided more details than were originally revealed. 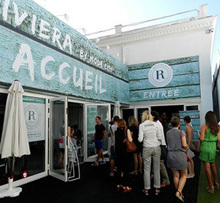 Eurovet said that the number of retail buyers attending the second edition, in Cannes on 7 and 8 September, rose by 17 per cent against the first edition in 2013, with French visitors from the Côte d’Azur, Corsica and Western Mediterranean coastal areas accounting for 82 per cent of the total. Nevertheless, a modest rise in attendance from Italy, Spain and Monaco was recorded. The report notes that international attendance could eventually rise significantly since the first two editions of the salon were promoted solely in France. In 2015, the salon will be staged on 6 and 7 September. The absence of easily reached specialized swimwear salons in Italy and Spain at that time of year suggests that the Cannes salon could well attract an appreciable number of buyers from those two countries, especially from the Liguria and Catalonia regions.